“Manu Samoa recently suffered another loss in their Northern Hemisphere Tour, this time at the hands of Georgia. A week earlier Samoa’s national rugby team lost to America. The two losses have triggered public debate. Our reporter Soli Wilson recently went out and got the views of the public, on what the Manu Samoa Coach should do, to get the team back to winning their games. We just need to keep encouraging our boys to do better and to push harder for a win. If that’s still not enough for a win, I would sack all the team players and replace every single one of them. First thing to do is to replace the coach. The coach needs to do a better job. The team is doing very good, there is no other team like ours, but they still need to work on their communication. The coach needs to push the team to do better. They should review the team positions right now. 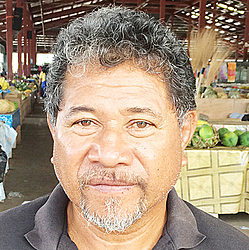 Most of the boys from overseas perform differently because their positions in the Manu Samoa differ from their usual positions in their overseas contracts. Plus, they should give the local boys a try. Some of those old players need to give the local young ones a chance because they are getting a bit slow. The team needs to have a good team talk. We can tell by the way they play that they are not used to each other—no communication, no team work. They need to try again. Sometimes the coach says one thing but the boys do another. One thing I know for sure is that they need to change the first five-eight to replace Tusi Pisi. Otherwise, everything else is okay. Coach is good as well as the players. All these losses mean that the team was inappropriately picked. They should not be picking boys that they have connections to, but those who have the proper skills and knowledge. That’s why we have the Super Nines Tournament to locate the local talents emerging from within our country. Another thing is the people’s support. The team needs to earn back the people’s support, because without our support, there won’t be any successful games. We need to look for the next step to make the team better. There was no time for the boys’ preparations. There was not enough time to put the team together, so there was not enough training together as a team. Also, the positions need to be revised, especially the first five-eigth position that needs a lot of improvement.